Many who would be willing to search for truth in the Bible are intimidated by its size, the length of time it spans, the different languages and cultures within, or questions about the historical reliability and contemporary relevance of Scripture. The Holman Illustrated Bible Handbook is designed with an awareness of the obstacles people have to understanding the Bible. It begins with an essay on &"How to Read and Study the Bible&" before proceeding to chapters that provide a thorough overview of each of the Bible&'s 66 books, summarizing each one&'s content, author, evidences of authenticity, and historical context. In addition to the full-color maps, photographs, reconstructions, and charts that equip readers throughout the volume, a smartphone-accessible QR code is included for each chapter that leads to related online teaching from noted Bible scholar Gene Getz. There&'s also an article by Jeremy Howard (general editor of the award-winning HCSB Study Bible) explaining how each book of the Old and New Testaments was accepted into the Bible. 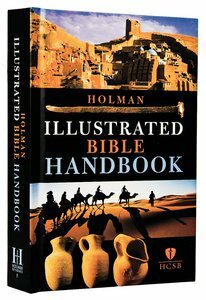 About "Holman Illustrated Bible Handbook"